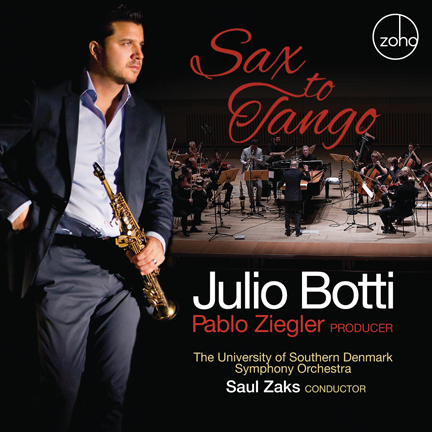 ZOHO Music is honored and proud to showcase Sax To Tango, the second CD collaboration between Argentine born, but New York domiciled saxophonist Julio Botti and his celebrated mentor and colleague, Nuevo Tango pianist, arranger and composer Pablo Ziegler. Their first collaboration "Tango Nostalgias" (ZOHO ZM 201207) featured two classic quintet settings, recorded in Buenos Aires and New York, respectively, with an occasional string quartet accompaniment. It achieved a Latin Grammy nomination in the "Best Tango Album" category in 2013. It is a great pleasure for me to present this new project for saxophone and orchestra. Saxophone was never a traditional tango instrument, but Julio Botti found a way to express Nuevo Tango through the saxophone just like a tango singer. That is why I consider Julio an extremely unique and talented artist. Primavera Porteña is a part of Piazzolla’s composition Las Cuatro Estaciones Porteñas (“The Four Seasons of Buenos Aires”), inspired by Vivaldi’s "Four Seasons". Primavera Porteña ("Buenos Aires Spring") was world premiered at the Regina Theatre in Buenos Aires, and recorded by the composer in 1969 along with Invierno Porteño ("Buenos Aires Winter"). Interestingly, although Piazzolla ended up composing a similar four-part cycle to Vivaldi, celebrating the seasons in Buenos Aires, these parts were composed at different times, and were not primarily intended to be performed together, or in seasonal sequence. - Since Argentina is in the southern hemisphere, winter in Buenos Aires is actually summer for the northern hemisphere. Nieblas del Riachuelo is a beautiful melody by Juan Carlos Cobian that expresses a foggy and mysterious Buenos Aires creek. On this small river, there are many old abandoned cargo ships that were used by Italian immigrants from Europe to Argentina. This neighborhood, including “La Boca”, one of the 48 barrios of Buenos Aires, is the origin of the traditional tango music. Años de Soledad In English, this composition is called “Years of Solitude”. It was composed by Piazzolla for the 1974 LP “Summit” in collaboration with the American baritone saxophone player Gerry Mulligan. Originally it was written for bandoneon, baritone sax and small ensemble. Fuga y Misterio was composed by Piazzolla as a part of an operita “Maria de Buenos Aires”. This fugue shows Piazzolla’s strong influence by Bach. This tune and “Allegro Tangabile” are the only instrumental pieces in this operita. Oblivion was composed by Piazzolla in 1984 for the soundtrack of the film "Henry IV" by Bernardo Bertolucci. This is one of the most beautiful melodies written by Piazzolla. Rojotango - the first of three of my compositions on this album - was originally written as an instrumental piece and later arranged as a song with lyrics by Oscar Balducci. It started gaining recognition in the opera world through the 2010 SONY Classical album “Rojotango” that I produced for the world renowned baritone opera singer Erwin Schrott. It received the German Echo Klassical award, and also featured Julio Botti on soprano sax. Flor de Lino was composed by Hector Stamponi. This tune is a waltz, originally written in the Buenos Aires waltz style with lyrics by Domingo Federico. The lyrics talk about the beauty of a simple flower that can be interpreted as the beauty of a simple life. Otoño Porteño ("Buenos Aires Autumn") from “The Four Seasons of Buenos Aires”, was written by Piazzolla in 1969, followed on this album by Verano Porteño ("Summer"). This was in fact the first tune composed among the four movements which later became the cycle. He wrote it for the play "Melenita de Oro ("Golden Hair") by Alberto Rodríguez Muñoz, in 1965. Milonga en el Viento I was inspired by the Brazilian composer Ivan Lins’ tune “September” to compose this piece in 1992. The world renowned director, Ettore Stratta who was at the time recording for the Warner Teldec record company, liked this tune and offered me the opportunity to record it with the Royal Philharmonic Orchestra for his CD “Symphonic Tango”. La Rayuela - also written by me - is a fast milonga tune was composed with a motive of hopscotch, the children's pitch and toss game. It expresses the joy of playing hopscotch, jumping between the squares in the rhythm of milonga. Libertango Composed by Piazzolla in the 1970’s as a part of a series of “Violentango”, “Amelitango” etc, it became one of the composer's biggest hits and most frequently recorded compositions. It was world premiered in Italy and later recorded. The song became hugely popular when American singer Grace Jones recorded an English language, disco version as "I've Seen That Face Before" in 1981. Produced by: Pablo Ziegler. All arrangements and orchestrations by: Pablo Ziegler. Recorded by: John Fomsgaard. Recording dates/location: June 10 - 11, 2015, at Koncertsalen Alsion in Sonderborg, Denmark. Mixed by: Alejandro Venguer. Mastered by: Oscar Zambrano. Photography by: Ivan Torti, Torben Andresen. Package Design by: Chris Drukker. CD cover concept: Angel Lucero. Executive Producers: Saul Zaks, Julio Botti.